I've said it before, but I just LOVE Marbling with Shaving cream. It is such an easy way to marble paper with lovely results. Rainbows have been quite popular the past month, so we decided to create some Shaving Cream Marbled Rainbows. It is the same process as our Shaving Cream Marbled Hearts, but I will still go over the steps to review. First, spread out some foamy shaving cream on a flat surface or in a tray or pan. Smooth it out a bit. Then use either food colors or liquid watercolors and put blobs of color with a paint brush or eye dropper. We made the colors in Rainbow order: Red, Orange, Yellow, Green, Blue, and Violet. Liquid Watercolors give the most vibrant color! Next swirl/marble the colors with a stick. We used a kebab stick. You could use a toothpick, popsicle stick, or even a stick from outdoors. If you had a fancy comb you could use that too. Now put a piece of paper on top of the swirled colors and press down and smooth your hands over the paper. Then use a flat edge to scrape the shaving cream off the paper. You could use a lid cut in half or even a piece of cardboard with a straight edge. 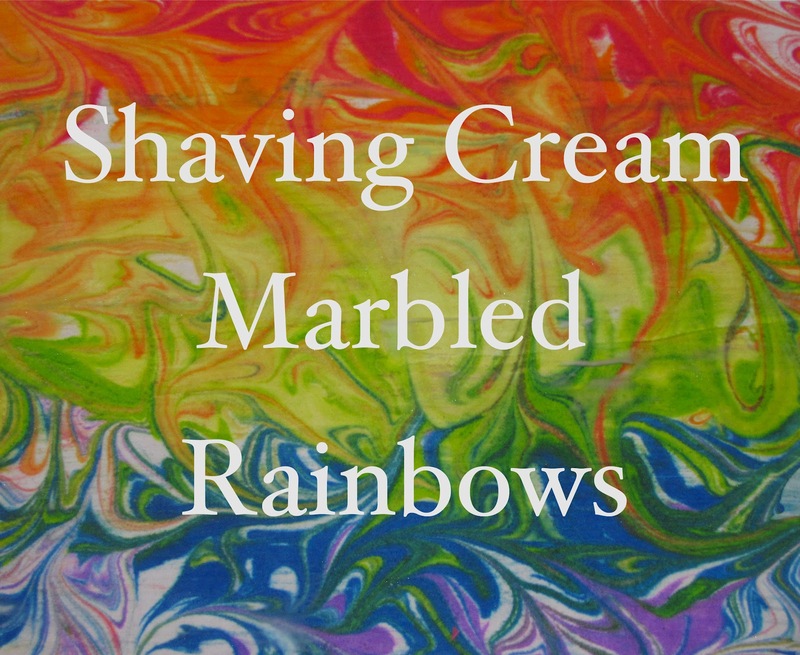 Scraping off the shaving cream reveals Gorgeous Rainbow Marbled Paper! This is a lighter version when the shaving cream and pigment have mixed up. If you want brighter results put a brand new clean layer of shaving cream and add the Liquid watercolors. 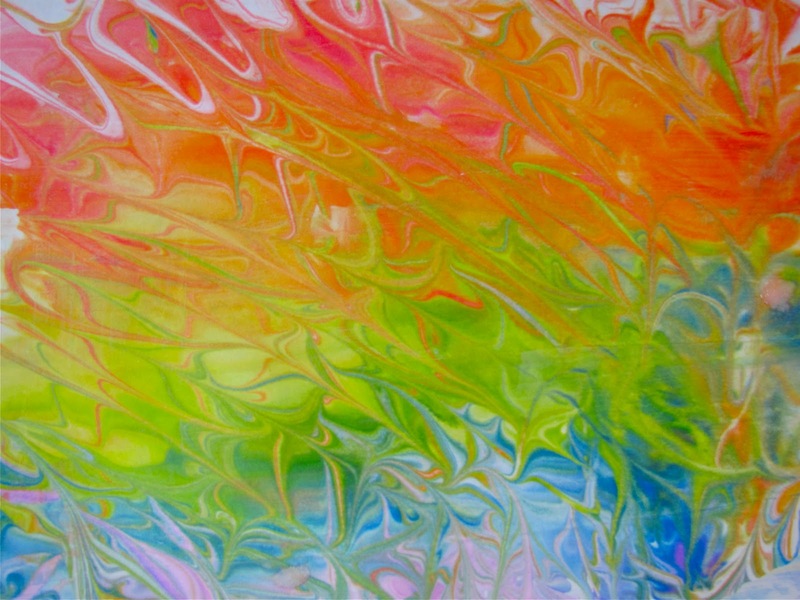 What would you create with this Rainbow Marbled Paper? You can use it for your cover page on facebook! It looks so beautiful and perfect for your blog! I just love rainbows! Yes Esther I was thinking the same thing! Rainbows are the best! The colours are gorgeous, Melissa! It doesn't matter how many times you do this activity, it still seems magical. The rainbow effect is amazing here! Thanks Happy Hooligans! It is magical every time. I agree. This method can also be used with fabric rather than paper. Then incorporate the fabric into a quilt. Lovely! This is beautiful!!! Thanks for sharing!! Your welcome and thank you Shannon! We've done it a few times already! Can't wait to see your take on it! Thanks! The process is great! Thanks Caroline! 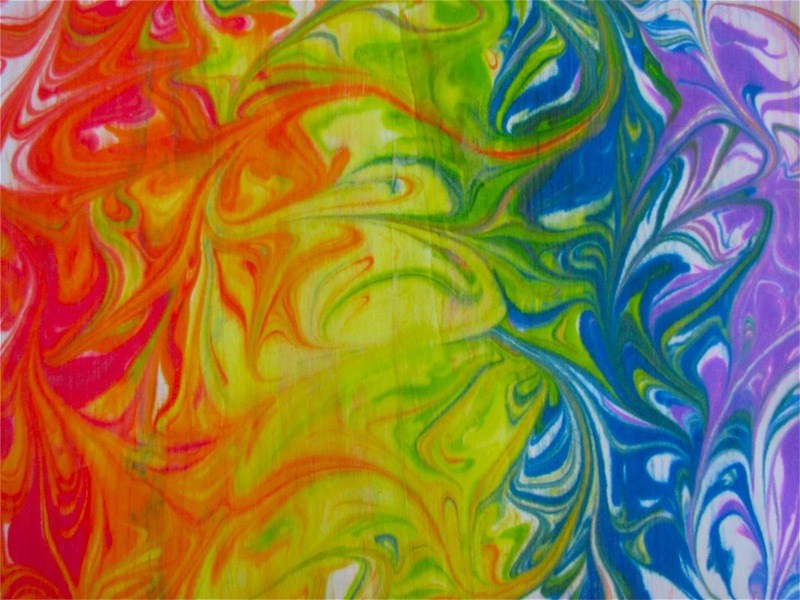 I kept seeing rainbows the past month and thought, why not do marbling in rainbow colors! I am going to do this and frame it as art for my new room. It's going to be great. I love how it feels and more, I love how it looks. Or do I mean it the other way around? Kids love this exploration!! Try some combs and things to make design, too. I love how the liquid watercolors worked. So pretty!! This is a great idea! I think I will have the kids make a few and cut them out in the shape of an egg for Easter. Thanks! i LOVE this idea!!!! do you think it would work on canvas? We did this once for christmas envelopes but only used christmas colors... We did the same thing but we just used a napkin to wipe it off... It lookes the same to me. But now im going to go look for liquid colors instead of food colors! I tried this with my daughter, but we couldn't seem to get the beautiful swirls you got. Any tips? colors get muddy. Hope this helps out. This is beautiful... What kind of paper do you use??? We used white sketch paper....thicker than just computer paper. Could you use acrylic paint instead of water color? Yes, but water the acrylic paint down. Let me know how it goes with acrylic paint. 2) your comment about "This is a lighter version when the shaving cream and pigment have mixed up. If you want brighter results put a brand new clean layer of shaving cream and add the Liquid watercolors" - can you explain this? You mean afterwards you gob another layer of shaving cream on top of the painting, and....? 3) any ideas how to make this last longer? Maybe to spray some kind of fixer over it? But what...? Hi Natasha, I've never seen the brown/black spots so I am not sure about that. For your #2 comment I mean to just wash away the shaving cream and watercolors and put a whole new layer on the tray/pan. So basically begin again because the colors begin to get muddier and muddier. Does that make sense? And #3 what do you mean by making it last longer? The colors have not faded on my marbled creations a year later. I would recommend using liquid watercolors for best results or bright Neon Food Colors. Good Luck and do not hesitate to ask more questions. Thanks so much, Melissa! Makes sense now :) hmmm, yes, will try and figure out about the black spots - and thanks, glad to know it lasts long if I use liquid watercolours! My site has a lot of unique content I've either written myself or outsourced but it looks like a lot of it is popping it up all over the web without my permission. Do you know any ways to help protect against content from being stolen? I'd genuinely appreciate it. I have just discovered your craft site. It is full of wonderful ideas. I work at a Nursing Home with Dementia Elders, some of the craft ideas we will be able to make. This will give older adults the ability to undertake crafts that will give them a sense of accomplishment, learn new crafts and also give the mental and sensory stimulation they need to keep busy. Your instructions are absolutely fantastic too ! Thank you so much, we are looking forward in making some of these items, you have opened up a whole new world of excitement !